Shrimp Paste Rice tastes like home to me. It combines all the core ingredients, shrimp paste, dried shrimp, green mango, chili peppers, lime and shallots, into one dish. The rice is mixed with shrimp paste and dressed with fried beaten egg, shredded green mango, fried dried shrimp, sliced shallots and hot chili peppers. Additional lime juice enhances the sourness. Contrasting the flavor of shrimp paste, the rice is eaten with sweetened pork. On my plate, I mix the rice with sliced shallots, fried dried shrimp, shredded green mango, hot chili and fried scrambled egg. The delightful aroma of different strong ingredients hit my nose. I tame the shrimp paste scent with lime juice. Each bite, I taste the shrimp paste and the crunchy fried dried shrimp. In between, I cut the shrimp paste flavor with sweetened pork. It's more than just a good dish, it's a complete visit to Thailand. Shrimp Paste Rice seems like a lot of ingredients and sounds daunting, but it actually has many simple steps. To the Thais, this dish is cobbling up ingredients at hand and making a new dish. Shrimp paste, shallots, hot chilies, dried shrimp are common, comparable to the mayonnaise, mustard and ketchup in most western homes. Many Thai families grow green mangoes in their yards or gardens. I love the simplicity of Shrimp Paste Rice, so, occasionally, when I see restaurants unnecessarily complicating it, I'm always surprised. 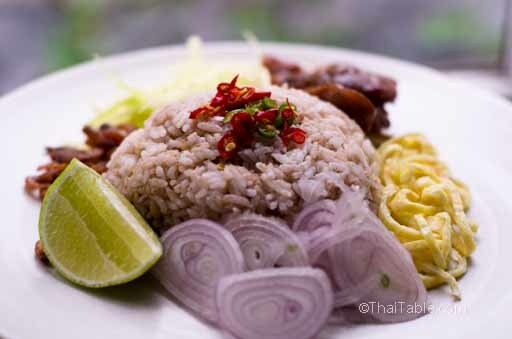 Many restaurants in Thailand prepare this dish by turning it into a fried rice, which totally misses the beauty and is a distortion from its name 'klook'. Klook means to mix together. A newer version of the rice also includes fresh green beans. For me, feeling at home is to have the version that I grew up with, pure and simple. A funny name for a dish but this is the favorite among kids. Just about every Thai mother has made son-in-law eggs for her kids. 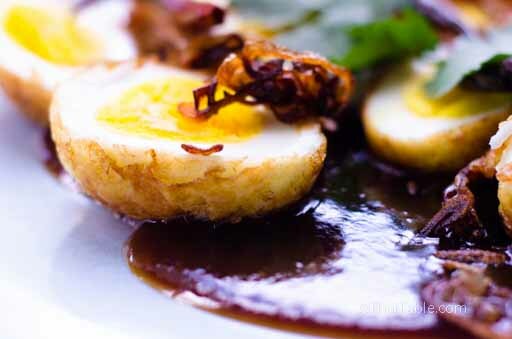 Boiled eggs are fried until golden brown and served with sweet and sour sauce. Son-in-law Eggs have all the Thai flavors: sweet and sour, with or without heat. For the adult version, fried chili peppers are served on the side. 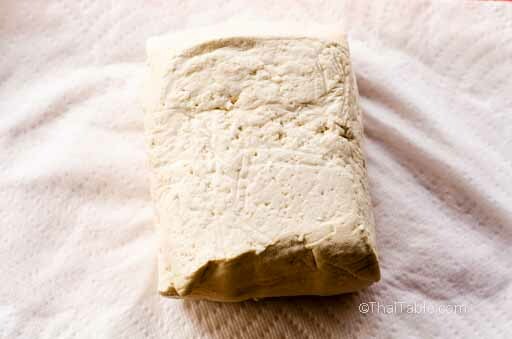 Firm tofu has less water content than soft or silky tofu. It looks similar to feta cheese and has feta cheese’s firmness but is not crumbly. During the tofu making process, the holes inside the tofu are formed when the tofu curds are pressed together to get rid of water. The tofu is usually sold in a sealed plastic tub with water. After the package is open, change water daily and keep tofu submerged in the water to keep it fresh. Keep the tofu refridgerated and use it within a few days. At some Asian stores, you might want to look for tofu in a large tub with several pieces of tofu lying submerged on the bottom of the tub. When you get the tofu home, keep it submerged under water and refridgerated. 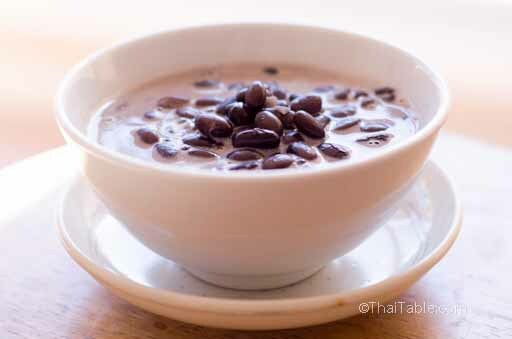 Black Beans in Coconut Milk is a dessert that Thais enjoy year round, unlike seasonal desserts like mango sticky rice and durian sticky rice. Black Beans in Coconut Milk is versatile enough to have other ingredients added to make variations. If you have sticky rice left-over from mango sticky rice, add a spoon of the sweetened sticky rice to the dessert to get a new texture and flavor. The black beans should be tender without the skin broken. The coconut milk sauce should be slightly purplish, not white and smooth without curds. You should be able to taste the palm sugar sweetness, which is distinct from cane sugar. The palm sugar is creamy and nutty. 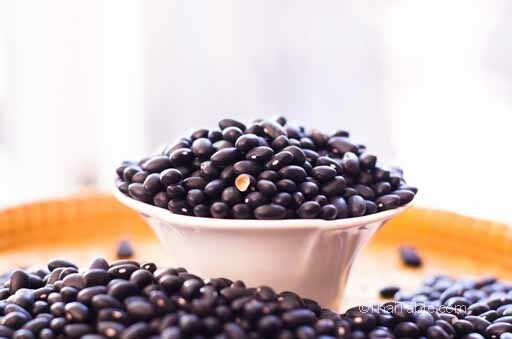 Black Beans are a common legume in Thailand. We use black beans strictly for desserts and snacks. Unlike other legumes, such as peanuts, they are never put into savory dishes. The beans are soaked overnight prior to cooking to reduce the cooking time and give smooth creamy texture. The soaked black beans take 25-30 minutes to cook until tender. Can you cook black beans without soaking? Instead of beer nuts, Thai people gather around a pot of spicy Tom Yum Pork Ribs. Real, old time drinkers prefer super hot and spicy soup, possibly compensating for half of the remaining working taste buds. This Tom Yum is popular with families as well. 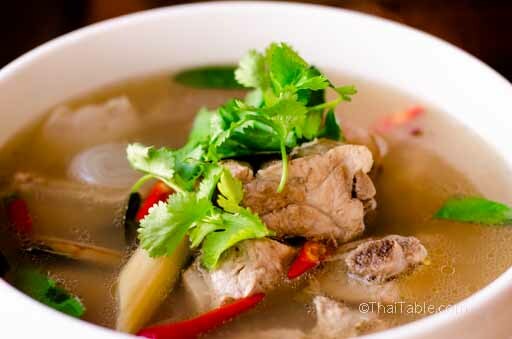 The hot and spicy broth compliments well other Thai dishes. In restaurants in Thailand, Tom Yum comes in a fire pot with hot flame flaring from the chimney in the middle. I often hear the instruction to stir often when cooking coconut milk otherwise it’ll turn into curds. I never questioned the common wisdom, just accepted that that is what we do when we cook with coconut milk. Recently, I met with a ThaiTable reader who asked why her coconut milk curdles. I promised her I’d find out why. Then I took the question straight to my biochemist sister who gave me a scientific paper to read. Roughly, raw coconut milk consists of coconut oil, protein and water. In its natural state and at room temperature (think tropical island), the protein acts as an emulsifier, keeping the coconut milk looking homogenous. An emulsifier bonds oil with a protein in the milk. 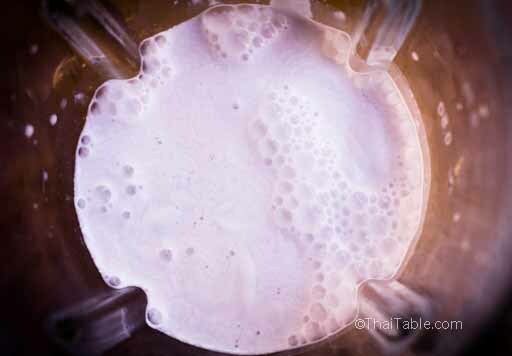 When coconut milk is heated up, the protein changes its shape and ability to react with water and oil, which is what scientists call ‘denaturing of the protein’. The protein releases oil and water and contracts into a tight chain. These contracted protein chains are visible as the white specks or curds. The curds can clump and get bigger if not stirred. This spicy tom yum soup is not just for vegetarians. 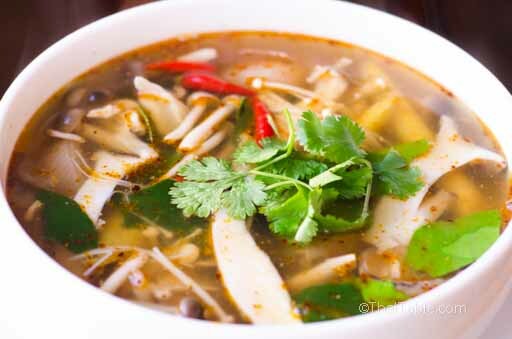 The clear broth soup is thick with flavor and spices. The lime juice perks up the soup, it's so refreshing. The aroma of lemongrass, galangal and kaffir lime leaves made my kitchen and the whole house smell so good. One word of caution about eating any tom yum, don't eat the lemongrass or galangal even though they are often served with the soup. They are there to flavor the soup. The kaffir lime leaves do the same job but they're chewable. Most people go for the mushrooms and the broth. Every year, I take a trip to Thailand to visit my family and friends. Some relatives and friends look the same year after year and some have gone through transformations...like food in Thailand. When I was growing up there was only one style of sweet roti and the vendors were South Asian immigrants. This style has the stretched dough spiraling into a round, flower-like shape, then flattened into a round disk. This roti is fried in oil with a small piece of margarine. When the roti is golden brown, the vendor places it on paper, drizzles some sweetened condensed milk and sprinkles some sugar on top and rolls it up. This roti is soft with a few crunchy spots and is very sweet. 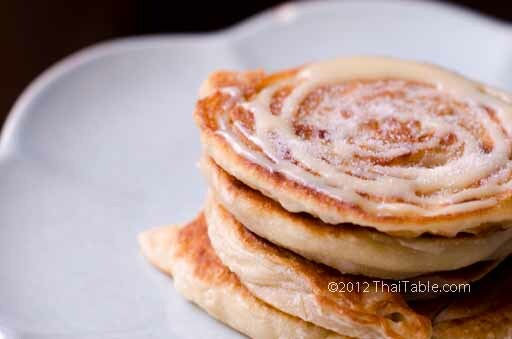 Off you go, eating warm, sweet roti, walking the streets of Bangkok. About 10 years ago, I noticed that I could get a super crispy roti at a mall. Street food gone high end? Then I started to see them everywhere. The vendors are no longer just immigrants but everybody and anybody who can make roti. I like the super crispy roti as much as my childhood roti. The super crispy roti has the same dough but stretched dough goes directly into hot oil. The increased surface area is exposed to hot oil, resulting in even more crunchy crispiness. The evolution of roti didn't stop there. I can now get fillings in my roti. Just like Thai cooks took over the original rotis from the Indians, the fillings show the their assimilation of other foreign foods. The fillings now range from bananas to strawberry jam, to the Italian Nuttela. Even simple cheese was not even enough, so now you can find pizza toppings. When you're in Thailand, stop at a roti stand and enjoy a warm roti with a long history. In the meantime, let's make it at home. Finding salted crab in a freezer section at an Asian market is as exciting as seeing snow falling in June. Because salted crab is hard to find, when I saw salted crab on a recent visit to the grocery, Som Tum, Salted Crab Chili Sauce and Green Mango Salad with Salted Crab flashed through my mind. I think of my mother's delicious Green Mango Salad with Salted Crab. 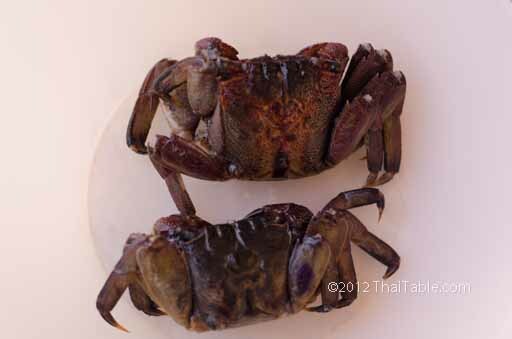 Salted crab is made from 2 types of crab, freshwater crab (ปูนา ) and mangrove tree crab (ปูแสม). Fresh water crab is commonly found on rice paddy fields. Mangrove crab lives in brackish water in mangrove forests. As the name suggests, the crab climbs on mangrove tree when high tide comes in. Both types of crab look very similar with blackish shell and sometimes reddish or purplish claws. The trapezoid shaped shell is about 1 1/2” x 2”. When I was a kid there was always a health concern about eating salted crab. It could give you a stomach trouble and worse, parasites. My mother boils it first before using it in som tum. You can also microwave or boil it for 5 minutes. The parasites only live on freshwater crab, not the mangrove tree crab. Since salted crab is made from both types of crab, please cook the crab before using. I also like to boil it to tone down the saltiness and get the beautiful reddish shell. This doesn't degrade the taste in any way.